Turn the light switch to the position. The engine switch is in the “ON” position (vehicles without a smart key system) or IGNITION ON mode (vehicles with a smart key system). When oncoming vehicles suddenly appear from a curve. When the vehicle is cut in front of by another. Houselights, streetlights, red traffic signals, and illuminated billboards or signs may cause the high beam to turn off. In the situations below, the system may not be able to correctly detect the surrounding brightness levels, and may flash or expose nearby pedestrians to the high beam. 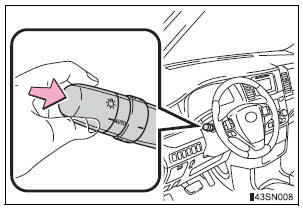 Therefore, you should consider turning the high beam on or off manually rather than relying on the Automatic High Beam system. Vehicles ahead have headlights that are either switched off, dirty, are changing color, or are not aimed properly. The vehicle’s headlights are damaged or dirty. The vehicle is lifting or tilting, due to a flat tire, a trailer being towed etc. The high beam and low beam are repeatedly being switched between in an abnormal manner. 15 to 20 seconds, and release. The indicator light on the inside rear view mirror will flash to indicate that the sensitivity has been lowered. 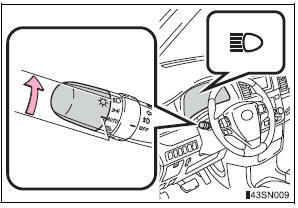 When the engine switch is turned to the “LOCK” position (vehicles without a smart key system) or turned off (vehicles with a smart key system), the sensitivity will be returned to its normal level. The Automatic High Beam can be turned off. Do not spill liquid onto the inside rear view mirror or the camera sensor. Do not place items on the dashboard. There is a possibility that the camera sensor will mistake items reflected in the windshield for streetlights, the headlights of other vehicles, etc. Do not install a parking tag or any other accessories near or around the inside rear view mirror and the camera sensor. Do not replace windshield with a non-genuine windshield. When the vehicle is loaded, headlight level should be adjusted to appropriate dial setting.